It’s time to get this confession out in the open. After 6 years of being in the hiring business, I’ll admit right out in the open: Traditional Q&A job interviews are ineffective and outdated. For reasons I’m unaware, the traditional Q&A interview is hardly questioned and is just widely accepted as part of the hiring process. In fact, I did a Google Search for negative articles on the practice of traditional interviews and didn’t see too many results. So allow me to submit the case that same hiring process is broken in the digital age. The manager asks the questions, the candidate gives the answers. The hour is up and the interview is over. Is this the best way to communicate ideas? Is this the best way to find out more about a candidate? Just asking questions? Not allowing for proper feedback from the job candidate? In my Recruiting experience, there’s been one common theme of the best candidates I’ve sent to interviews: they have been frustrated. Not frustrated they couldn’t answer the questions properly. Any competent job candidate can answer questions. Unlike the average candidate, before the interview, they are researching the company, exploring great ideas to share regarding how their experience relates to the job they are seeking, they are coming with great questions and discussion points. Their excitement only gets squashed when they are asked “what is your greatest weakness?” and alike questions. Notice the disconnect? What’s worse, traditional Q&A interviews are too often left unresolved. The solution? More interviews that the candidate and employers alike do not have time to conduct. This exceptional candidate I mentioned in the previous paragraph is typically highly sought after by other companies. They will not be on the job market long and will feel left out in the cold by the process. A) An employer will be working with these individuals on a daily basis–why not get to know them by encouraging dialogue vs. just asking a bunch of questions? You’ll be seeing them each day, why not find out if they have the right personality to fit in with the team? B) The traditional Q&A interview favors those who can BS their way through the templated questions–no good. Instead, I begin an interview by asking “what questions do you have for me?” and let that be a guidepost to how the conversation goes. If the candidate says “I don’t have any questions,” I’ll know right away without wasting time they are not prepared–I can cut the interview off in 15 mins and move on. C) By having a pointed and honest conversation, the best candidates are satisfied all their research and preparation did not go down in flames. Again, nothing is worth than a job candidate walking out of the interview without getting to any talking points they researched. As an employer, it’s not good to let those candidates get away. D) Efficiency: Like I said, I prefer to “cut the crap” and have a detailed conversation about the job and the company. I can usually find out in 5-10 minutes if they are not right for the job by opening up the conversation. Why waste time? I understand the traditional interview apologists will fault my lack of structure, and they might think why give free reign to the job candidates to speak freely? Unless this position involves a very high level of scrutinization (like a high-level security job in the government etc), there’s no need to make candidates feel like they are under a microscope answering a bunch of unrelated behavioral questions. This is an employees market (at least in the US) and you want the best candidates. Make your interviews accommodating without getting off track. I hope this article is helpful to both job seekers and employers. The Resume Professional Summary: Is it Necessary? How important is the Professional Summary on a Resume? Imagine your baking a chocolate cake. You mix water, sugar, flour, and baking soda. You put only these contents in the oven and bake. Whoops, the chocolate was not added. Not adding any chocolate to the chocolate cake sounds ludicrous. Not adding Professional Summary to your resume is really the same concept. That’s right, the Professional Summary is the main ingredient on your resume. I would argue, in fact, the Professional Summary contains about 80% of the resume’s value. The person reading resume will likely scan the Professional Summary, and if it isn’t effective, they will read no further. If there is no Professional Summary, chances are they will just skip your resume and move on. As a resume reader, searching all over the resume for skills is downright frustrating. Just skipping the resume and moving on to the next applicant is much more efficient. Writing a solid Professional Summary is actually quite simple. First, put yourself in the reader’s shoes. Identify what they believe is important to know about you. Chances are they have a job opening based on a need that they are often times desperate to address (in fairness, the desperation doesn’t reflect in the pay often). If you properly answer the question: Why are you the best person who can perform the needs in the job description? The manager will not have a choice but to schedule that interview right away! Now, I said the Professional Summary is 80% of the resume’s value. Why is the rest of the resume only 20% of value? The Education Summary is simply to indicate for the reader your highest degree or certifications/training completed. You could be the best student of all time, but in the crude world of hiring, industry experience trumps educational accomplishments. The Work Experience Summary (I prefer to call it Detailed Summary) simply shows what companies you performed the skills in the Professional Summary, the size of the companies, the industry related relevance in your past, and if you have a solid work history. There’s value in the other summaries, no doubt. However, readers do take 6 seconds to scan a resume. Make it easy on the reader, and add a powerful Professional Summary to land that interview! If you would like to learn more information regarding my resume writing and career services, visit thepinescareerservices.com. Come to think of it, I’m probably the only one on earth who constantly wonders this. Several jobs in the past years. Working in a field where you have too many roles to contain on one page. One of the biggest mistakes one can make when writing your resume is attempting to shoehorn a wealth of great experience onto a 1 page resume. The balance is fitting all the job headings along with relevant and focused information into the shortest amount of page length possible. Most of my clients will typically arrive on a 2-3 resume as the best solution if they are in the 5-10 year point in their career. Of course, it’s not a good idea to go overboard. Many individuals who have over 10-15 years experience tend to want to add every aspect of their experience throughout their career. The resume needs to be focused and clear to the reader. It is very possible, if not required, to contain 15 years of experience within 4 pages. In fact, some companies have an “unwritten” 4 page” rule for ALL resumes they review. By Gary Jones, Owner of Pines Career Services. We offer Premium Resume Coaching and Interview Preparation at a discounted price. Be sure to click here to subscribe to our YouTube Channel for more helpful content. FREE Resue Evaluations! Visit our site here: The Pines Website and contact me directly to have your resume evaluated for FREE! This is a limited time offer. Several months ago, I recruited a candidate (we’ll call her Sara) for a QA Engineering position at a small but up and coming company. Sara’s strong interviews and journey from being one of 50 candidates to earning the job offer is a great lesson in persistence and drive. I am looking forward to sharing her story with you, and how you can benefit from her interview approach. When I saw Sara’s resume for the first time, my reaction was tepid. Sara did not have Team Lead experience which the position required. It was definitely worth giving her a call because she had an intriguing background despite, on paper, not having some of the required qualifications. As you’ll see later in this post, I was very excited after our phone call about passing her resume along to the hiring manager. I called Sara and she was clearly prepared for my call. She asked me questions about the job description which showed me she thoroughly read it prior to our call. The best advice I have for job seekers is when they apply for a job, be ready for that phone call. It is a big turnoff when you call a candidate and they simply forgot they applied. I was honestly worried what would happen if Sara didn’t get this job. Why? Failure was not an option was according to Sara’s outlook. Employers love candidates who go for the brass ring and show they want the job more than all others vying for the role. Employers are humans like everyone else and they feel secure hiring job seekers that truly want to join the organization. Sara researched the company. She checked out employees LinkedIn profiles to learn more about the team. She conveyed what she liked about the company and how she could picture herself thriving in the company and why she is the best candidate. Her type of research will come in handy when employers ask “do you have any questions?” You need to be ready to ask, otherwise, it gives the clear impression you were not ready for the interview. If you ask specific questions about the position and company, it not only gives you vital information but the hiring manager will be satisfied you are prepared for the interview. Sara made an effort to Connect with the Interviewers, and it worked. The manager’s feedback after Sara’s interviews gave me hope she was going to get the offer. They mentioned it wasn’t a traditional Q&A format, but found themselves just having a regular conversation with her. Sara let her personality show, and again, she came prepared with questions. In her interview, it was a 2-way street of communication between her and the managers. You may have the best personality in the world, and make an earnest effort to connect, but not everyone on the other end will be open to connecting. My thought is if you put the best version of yourself out there, then it’s the manager’s loss if it didn’t work out. It’s okay to be yourself and show everyone what makes you great. Now what Sara did following the interview will rarely work out, but hey, this is a true story so I’m giving you full disclosure. Sara was not offered the position after the interview. What? Here I am talking up Sara for this entire post and she didn’t receive an offer? It came back to the original sticking point: she did not lead experience required. The manager; however, said they were not offering her the position at this time. As a Recruiter, my ears perked up at the phrase “at this time.” So, I went back to Sara and reported they are not making the offer but be patient because you are still an active candidate. Sara wrote a “thank you” letter to the employers and told me she was going to adjust it and make a direct case why she is the best person for the job despite not having lead/management experience. Now, I knew this was the equivalent of throwing a “hail mary” pass in football hoping to score a Touchdown at the end of the game. With that said, I was trained in this industry to always exhaust all options before giving up—-what the heck, give it a try! Two days later, the Employer came back and offered Sara the role. Sara was beyond thrilled of hearing the news and we were both insanely satisfied the hard work paid off in the end. By Gary Jones, Owner of Pines Career Services. We offer Premium Resume Coaching and Interview Preparation at a discounted price. Contact gary@thepinescareerservices.com and please attach a copy of your resume if you are interested in individual sessions. Congratulations, when preparing for your job interview, you took great advice from your Recruiter. You woke up plenty early, allowed time for a good and hearty breakfast, fired up Google Maps for directions, and Shazam(! ): You beat the traffic and arrived 30 minutes early, and you located the building where the interview takes place. You did everything so far by the book. Great job. You deserve a right pat on the back. With 30 minutes left before the interview, you’re in the car deciding whether or not to enter the building and report for the interview. Should you walk into the company’s lobby? 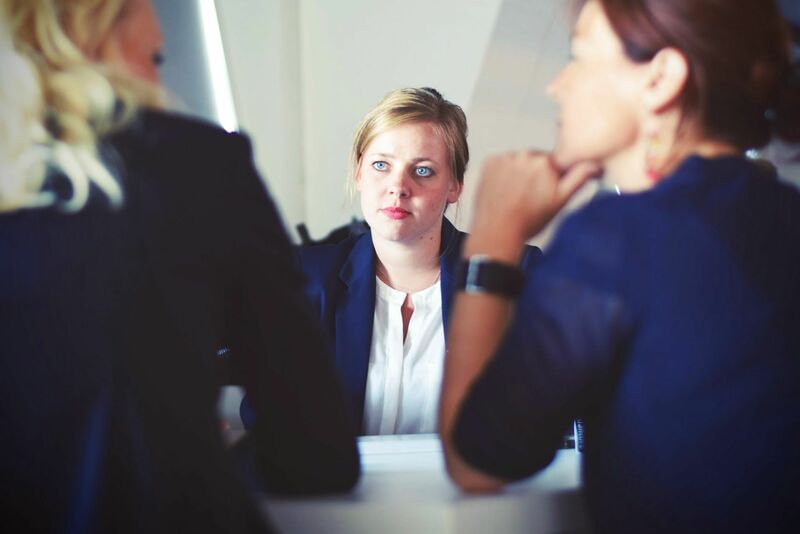 From personal experience as a hiring manager, when a candidate reports too early for an interview, I get a little nervous having them sit out in the lobby. I realize I’m being unfair, but my first thought is, “what are they doing here so early? That’s weird.” Being the people pleaser I am, sometimes I’ll drop regrettably drop everything, and conduct the interview right on the spot. The office or building may be closed prior to your interview. Camping outside a closed building like you are waiting for Pink Floyd tickets is not a good look. 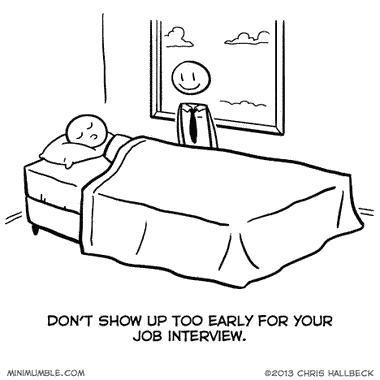 Showing up too early may come across like you are hoping to interview on your time, not the managers. For your sake, if you sit in a lobby for a long time, you’ll naturally get a little bored and even drowsy. Yawning during the interview, again, is not a good look. Even though showing up to the office 1/2 hour early is not recommended, parking your car somewhere (safe) near the interview site is fine and dandy. Review notes one more time. Relax, listen to music, envision the interview going well. Take a short walk, if the weather is nice, and maybe stretch out a little. Stop in the restroom. Quite frankly, the bladder will be nervous and full from all that liquids you drank (see next bullet point), and it’s the last proper opportunity to check your appearance. Before you leave the house, map out a coffee shop near the interview site. If you have plenty of time, stop by the coffee shop and grab a beverage. Phone a friend. Yes, talking to a friend can help you put your mind at ease. Is there anything better than words of support and encouragement before the interview? It’s important if you take any of these steps you are keeping close track of time and make sure you can find the interview site if you park nearby. I hope you find this article helpful. Like and share! When writing, editing, and formatting your resume, there are quite literally hundreds of things to keep in mind. It can get downright complicated. Yet, there are some quick and easy steps to instantly upgrade your resume. A solid professional summary will not only make your resume better, it is an absolute “must have” to get your resume noticed by decision makers. In fact, a resume without a professional summary will reduce your chances of getting hired by over 237 percent. Okay, I completely made that number up, but I bet it’s pretty close to accurate! A professional summary demonstrates your skills, background, and offers a keen overview of who you are as a candidate. Plus, the reader simply will not take their valuable time to search all over your resume for key skills. They simply do not have that kind of time. The information will be right there in your summary. Time will be saved and everyone will be happy! For help with writing your summary, book a session with me at Pines Career Services. Properly detailed job headings are essential. I can tell you first-hand hiring managers are looking for these four items listed in the above title. Eliminate the instances of having decision makers climb the deadly “ladders of inference” when they read your resume, and provide the details they are seeking in your job headings. Bullet points are helpful to anyone who views your resume. They should be in the summary, job headings, and sometimes in the educational, achievement or technical summary depending on the resume. Adding bullet points organizes the information and makes the resume much easier to read. One important aspect of bullet points is if you add it to under one job heading, you must add them to under all job headings. Continuity is key to your resume. It might appear you forgot to add bullet points, and it will appear inconsistent. Objective statements mostly not necessary since the advent of the online application. Applying for a job, with an objective statement on the resume, is like a golfer telling everyone before their swing, “My objective is to hit this ball off the tee.” The objective statement is very redundant. It should be understood if you are applying for a position, that’s the position you want. However, if you would like to add an objective statement to your resume when you are dropping it off at a job fair, forwarding it your network, it’s acceptable to have the objective statement since you are not applying for a specific job. With that said, I am personally “anti-objective statement” across the board. I believe a job seeker can craft their resume to weave the implied objective. After I write this blog post, I am going to send it to my friend to proofread. He will reply back 30 seconds later and say it looks good. He probably won’t even open my link. He is a bad friend. Have a better friend than mine or someone in your network review your resume for grammar and spelling (or if they offer additional suggestions, great). It’s essential to have another set of eyes review your resume. They can offer great feedback and help you along substantially. And remember, you have a great friend here at Pines Career Services who can review your resume in a “One on One” setting and provide expert assistance on writing your resume. I hope you enjoyed the shameless plug as much as I did. Good day and Be Kind! I am Gary Jones, founder of The Pines Career Services (TPCS). I am very excited to introduce our company and feature what you will find in our upcoming articles. JOB SEEKERS: WE’RE GOING TO DO GREAT THINGS! The job market is tough. We have the tools to help you succeed. The mission of TPCS is to provide the absolute best support and direction in the industry for job seekers. We primarily assist job seekers with Resume Coaching and Interview Preparation in a “one on one” session typically over Skype; however, we can talk about a variety of other topics as well in your job search journey. We fully understand extensive challenges job seekers face in this competitive job market. The current application to hire ratio is 100 to 1. Even though we are in a strong economy, hiring managers are expecting more from job seekers than ever. Resume writing can be an especially overwhelming task which has changed dramatically especially in the past few years. TPCS will help you overcome the odds. The content is the TPCS blog is to help individuals with their resume writing and interview skills. We will explore additional topics regarding the Career Services industry to benefit job seekers. Please send suggestions or questions and I will address them in this blog. In addition to our blog, please check out our upcoming Youtube channel for weekly segments which cover resume writing, interviewing, and we’ll have a weekly book review on job seeking topics (I read a lot of books). Like us on Facebook and follow us on Twitter as well! For more information on booking a session including session prices, please e-mail gary@thepinescareerservices.com for more details, and check out our website at thepinescareeerservices.com.